Walter Cronkite didn't get a burial at sea, but it wasn't far off. Time and again over the course of his funeral service, held this afternoon at St. Bartholomew's Church in midtown Manhattan, friends of the network news legend, who died last week at 92, brought up his outsized love of sailing. One recalled that Cronkite was known as "the Commodore" of the multivessel yachting expeditions he liked to lead. Another friend, former Tonight Show producer Bill Harbach, read John Masefield's "Sea-Fever," a poem about sailing that Harbach says he recited to the former CBS anchor on his deathbed. 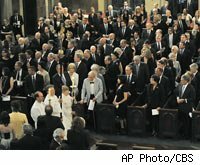 The eulogies were largely in a spirit of celebration, not grief. But the ceremony wasn't without its poignant moments. Before an audience filled with colleagues including Morley Safer, Barbara Walters and Ann Curry, Andy Rooney of 60 Minutes offered a recollection that ended abruptly when he became too emotional to continue. "I just feel so terrible about Walter's death that I can hardly say anything," said Rooney, after recalling how the two met while working as foreign correspondents during World War II. "He's been such a good friend over the years. Please excuse me." But Sanford Socolow, Cronkite's longtime producer, lightened the mood with a series of humorous anecdotes that played against the deceased's formidable reputation as "the most trusted man in America." Socolow recalled how Cronkite once insisted on experimenting with ad-libbing his way through broadcasts rather than using scripts -- an experiment that ended quickly in chaos; how he once forgot his own name while signing off; how producers had to deceive him about the length of segments to keep him from running overtime; and, most amusingly, how he struggled mightily with a certain word. "He had a horrible problem with the second month of the year," said Socolow. "He never could pronounce it right. It got to the point where we would rehearse him for about the last week in January, and it worked -- for about a day or two. Then there would be a relapse." The service ended on an upbeat note, with a raucous swing rendition of "When the Saints Go Marching In." Cronkite, who played clarinet -- badly, according to Socolow -- surely would have enjoyed it.